If you suffer from dental damage, like cracks, fractures, large fillings, or severe decay, dental crowns may be right for you. Dental crowns are one of the leading treatments to restore dental function and appearance. Each dental crown is a custom-made, tooth-shaped restoration that completely fits over the affected tooth, protecting it from further damage. To find out if dental crowns are right for your needs, we welcome you to schedule a consultation with Wilmington dentists Jeffrey Emmi and Laura Dougherty. Broken, cracked, or fractured teeth: Broken, cracked, or fractured teeth won't repair themselves. In fact, if left untreated, they can lead to major dental damage and oral health issues. Custom-made dental crowns can often be placed on broken teeth to protect them from further damage and restore the tooth's biting ability and appearance. Large dental fillings: Large dental fillings can leave the walls of the teeth weak and vulnerable to breakage. Placing a dental crown over a tooth with a large filling can restore the strength of dental walls while protecting the underlying tooth from further damage. Root canal therapy: Root canal therapy is used when the pulp and nerve tissue within the root canal become infected. Often, dental crowns may be placed on a tooth that has undergone root canal therapy, restoring its strength and function. Tooth decay: Dental crowns may also be used to restore teeth that have been damaged by decay, especially in cases of severe decay. Missing teeth: When combined with dental implants, dental crowns may be used to replace missing teeth. Cosmetic issues: Because dental crowns are custom-made to the desired shape, size, and overall appearance, they can also be used to address cosmetic issues. After we determine that a patient is a good candidate for dental crowns, the treatment process can begin. 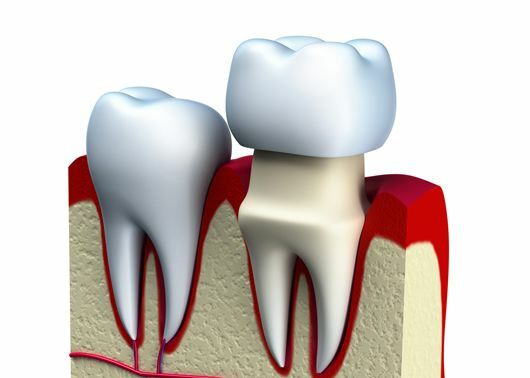 In general, dental crown treatment requires two dental appointments. During the first appointment, the tooth is cleaned and prepared for treatment. Impressions are also made, which are then sent to a dental laboratory for precise fabrication of the crown. While the crown is being made, a temporary crown will be placed. Once the crown is ready, a second appointment will be needed to remove the temporary crown and place the finished crown. Dental damage can be dangerous to oral health, and affect the appearance of your smile. Dental crowns can repair damage and improve the appearance of your smile. To find out if dental crown treatment is right for you, schedule a consultation with Drs. Emmi and Dougherty today. Our dentists and staff hope to hear from you soon.